A selection of snack sandwiches built on the foundation of Mestemacher whole grain breads. Many of these recipes could quickly adapt into party appetizers. Cured Serrano ham and juicy sweet melon well-supported by the robust flavor of Whole Grain rye bread. 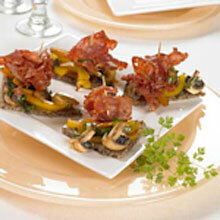 Browned sliced chorizo sausage with peppers and mushrooms on triangles of Mestemacher Westphalian Whole Grain Bread. Sliced prosciutto ham paired with fruited cream cheese spread, garnished with walnuts, grape, and arrugula, on triangles of Mestemacher Natural Whole Rye. Fitness sandwich of grilled or stir-fried mediterranean vegetables with herbed cream cheese on Mestemacher Fitness Bread.